Can you believe Labor Day weekend is next week?? This summer has flown by & it's been such a good one! I go back and forth daily on whether I'm ready for fall or not. Some days I'm ready for cooler weather, new fashions & fall TV ;). Other days, I'm sad that sandal weather, beach weather & BBQ weather is ending! Before the summer ended, I had to share these glam sandals with you all. These sandals are by a brand called fibi & clo, which was a brand that was new to me up until about a month ago. As soon as I visited their website, I knew I wanted to try a pair of their sandals! Each pair was so statement making & sparkly...and what girl doesn't love a little sparkle??? I opted for the Austin Black Patent, an all black sandal with statement turquoise stones down the foot. They were so pretty & match a ton of outfits in my closet. On this particular day, I decided to wear a simple black dress and my trusty denim jacket to allow the sandals to really stand out. Other favorite fibi & clo styles of mine include: Florecita Gold - a gorgeous gold gladiator style sandal, the Cabana Jelly in black and gold - a cute, casual, waterproof, flat sandal with a fun tassel detail and Central Park Grey - a simple style sandal with vintage inspired stones. These sandals are simply elegant! 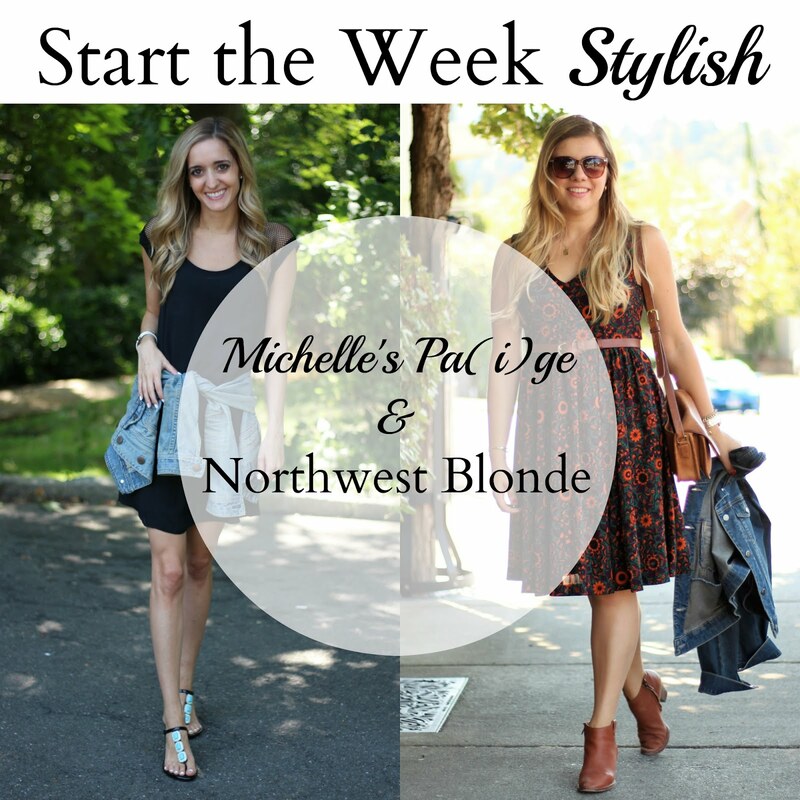 Last week we loved how Jill from Doused in Style & Fonda from Savvy Southern Blog styled pink. I love those sandals, Michelle!! I am trying to wear the heck out of them now, while it's still warm! Me too - gotta enjoy these last few weeks! Those sandals are so cute! I'm also loving the mesh shoulder detail on your dress! Thank you so much for the feature! Loved your look last week! I love your outfit but the shoes really are the star of the show! You never go wrong with black and denim in my book! Peace! They sure are! I love how they make a statement with all of my outfits. Such pretty sandals, Michelle! And I love that dress with the shoulder detail. It is perfect to let the sandals stand out, too. Have a fabulous week. Thank you! A LBD & LBS (little black sandals) are the perfect match! Gorgeous sandals and I love your dress! Beautiful look! I love these sandals! The stone detail is so fun, and that is such a cute LBD! You look amazing in this outfit! I LOVE that dress! The detail on the sleeves is stunning. Great sandals too! I love the little fishnet sleeves on this dress! Totally 90s and totally trendy! I love it! It is kind of 90's isn't it?! I should style it that way! Love the mesh details of this top! The sandals are so chic too. Thanks for the link up Michelle! Cute sandals! Perfect with your black dress. So cute! Nice pop of color with your black dress, which I also love! I love how you wrapped that denim jacket over the dress! Cute sandals too, Michelle! I go back and forth between wearing it and tying it around my waist LOL. The temps outside are hot but the A/C gets chilly. These sandals look perfect for summer and add such a great pop of color to your outfit! Your outfit is so simple and fun! Also, how cute are the sandals?! They add such a lovely pop of color! I love them! Such a great pair to wear in the summer. Love the elegant simplicity of this outfit! The bright turquoise of the sandals provide the perfect pop of color for this look! I styled my whole outfit around these perfect sandals! Love the styling, so chic and simple and those turquoise sandals look so great!